FPV(First-person view) flying is an incredible experience. 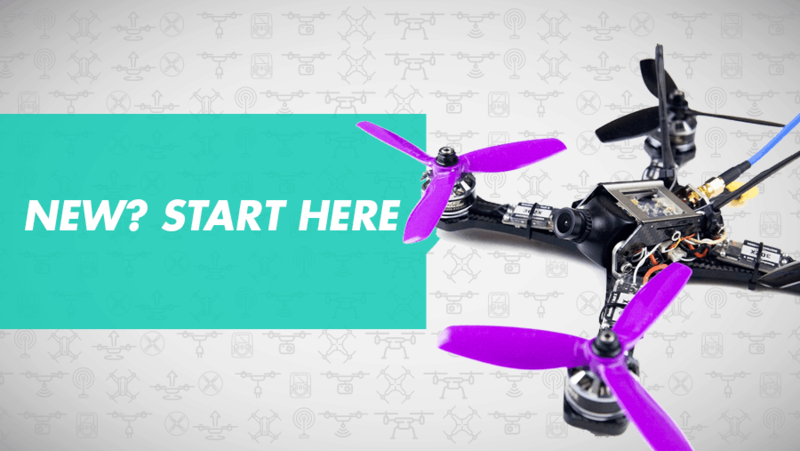 You can experience what it’s like to fly like a bird, zoom through your own personal roller coaster doing flips, rolls, crazy maneuvers, or if you are more relaxed, you can just soar and enjoy the view – through FPV goggles. And if you’re a speed addict, you can race at breakneck speeds through airgates and around flags and obstacles. 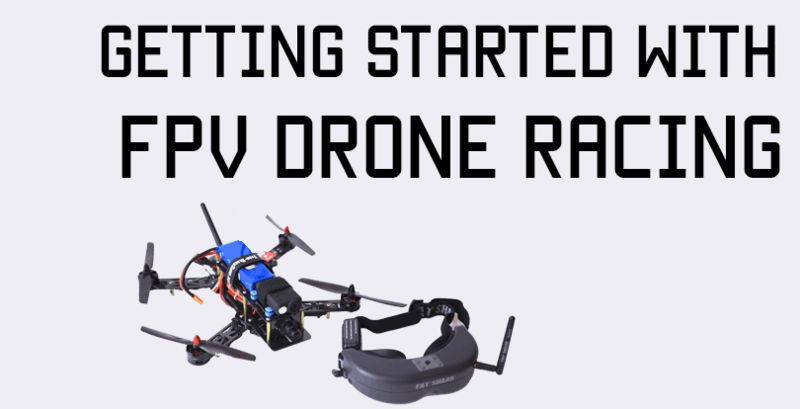 A huge part of enjoying FPV is making sure you have the right equipment, and choosing the best FPV goggles is one of the most important purchase decisions you’ll make. My name is Oliver, and I am obsessed with FPV flying. I’ve been in the hobby for quite a while now, and I live, eat, and sleep quadcopters and FPV. Whenever I get some free time, I’m watching quadcopter videos or practicing on the simulator to get better at flying. I love this hobby and I want to share the love of this hobby with you. It’s very important that you have the right(but not necessarily costliest) stuff to enjoy the hobby fully – and this is something I wish I knew before I got started – so I hope my experiences will help you avoid some of the mistakes I made. When you are looking for the best goggles for your fpv experience, there are a few things you’ll want to consider before making your choice. Cost: As far as hobbies go, FPV flying is definitely more expensive than crochet or quilting! FPV goggles are a one-time investment, so you’ll have to be prepared to spend at least $150-200. There are some cheaper, ultra-DIY solutions, but at the end of the day, after all costs have been added up, they cost pretty much the same. Form factor: For me, this is an important consideration. FPV goggles are of two types – box type and goggle-type. 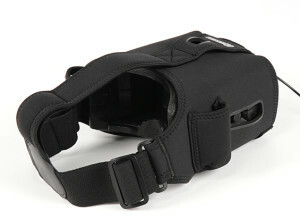 Box goggles such as the HeadPlay HD and Quanum V2 are very big and so a little difficult to carry. They are very comfortable on your face, but transporting them is a little cumbersome. Other goggles such as the Fat Shark goggles are much sleeker and fit in a small case. 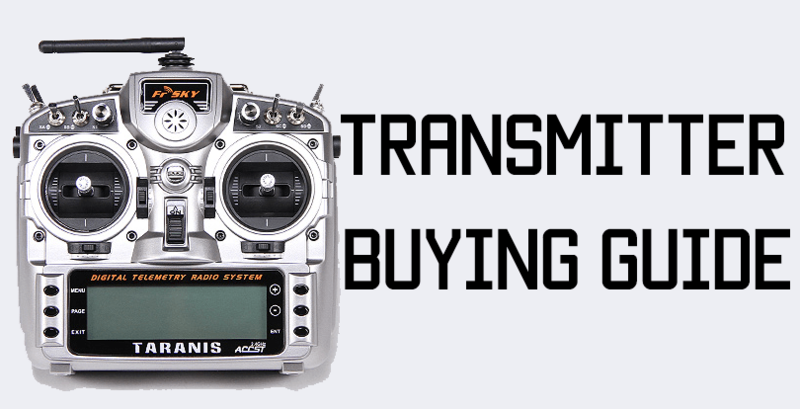 Receivers/frequencies: FPV flying for now is done by transmitting video the old-fashioned way – analog over frequencies! As far as flying multi-rotors(quadcopters) the most common frequency range is 5.8 gHz. Some goggles, such as the Fat Shark Attitude and Fat Shark Predator have a receiver built in, while some, such as the Quanum V2 and Fat Shark Dominator require separate frequency modules. Going into detail about frequencies is the scope of another post, but one thing you must know here is that frequencies have channels and bands. 5.8 gHz is a whole spectrum of frequencies, and most FPV flying is done over 40 channels. You must match the frequency of your video transmitter to the frequency of your receiver. Some goggles like the HeadPlay HD and the Boscam goggles have a built in 32 channel receiver, which means they will be compatible with almost all transmitters. The Fat Shark Attitude and Predator have an 8 channel receiver, and with the Quanum V2 and Fat Shark Dominator, you can have any channel receiver from the ones available, so there is a lot more flexibility. Resolution and FOV: Resolution is the amount of vertical pixels by horizontal pixels the screen in your goggles is capable of showing. A higher resolution means a clearer picture. FOV stands for Field Of View – basically how much of your vision the screen can cover. Smaller FOVs are smaller screens – and larger FOVs are larger screens. I’ll have a table for you below in which I’ll compare the FOV and resolution for different goggles. Recording capabilities: Some goggles have a built-in DVR(digital video recorder). This lets you insert a memory card and record everything you see from the goggles. The recording will be nothing to brag about, because the camera sending the video isn’t the best, but this footage can be especially useful in retracing your flight path when you go looking for a crashed quad! Headtracking: Certain models also have a feature called headtracking in which the camera on your model will pan and tilt according to your head movements. This is more useful for slower and higher flying where you can get an immersive view of your surroundings. On racing multirotors, you’ll be going so fast and in such tight spaces it is a bad idea to look away from exactly where your quad is going for even a split second! What if I have glasses? If you have glasses(as I do), there are a few solutions. You can either go for the large box goggles(I’ve tried the Quanum V2 and they fit over my glasses), or there are diopter inserts available for the Fat Shark goggles, too. You can also get custom diopter inserts, which I use and have been very happy with. Or get contact lenses. 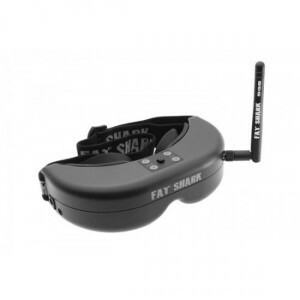 The Fat Shark HDOs are the newest addition to Fat Shark’s lineup of FPV goggles, packing a much improved OLED screen and higher power capacity for receiver modules. The screen is reputedly much sharper than previous models. Many pilots, upon trying the goggles, immediately were wowed by the upgraded screen, but a few didn’t really notice. The Fat Shark Attitude V4 goggles are sleek, have excellent picture quality with a 32 degree FOV, and come with a 32 channel OLED display. They are a much better step up from the older Attitude V3s since these goggles have a larger field of view and an OLED display to easily change channels, as well as a DVR for recording your flights. The Attitude V4s are decently priced with a receiver. If you have a little more room in your budget, then definitely go for the Dominators. They will cost you a little more, coming in at about $400 including a receiver, but you’ll have the benefit of a higher quality screen plus swappable receiver modules and the options to add diversity receivers. The Attitude V4s don’t fit any other receivers aside from the stock ones. With that being said, the Attitudes are still an awesome pair of goggles for the money. 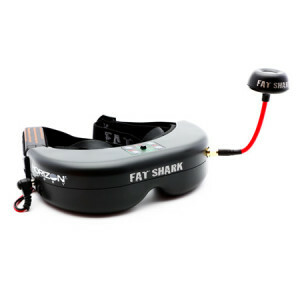 The Fat Shark Dominator V3s are an upgrade from the super popular Dominator V2. The Dominator V3 is around $350 and you’ll have to purchase a receiver module separately. This allows you the flexibility of flying on whatever bands you wish if you use a 32 or 40 channel receiver. There is also a built-in DVR. The Dominator V3s have a magnificent field of view, and it literally feels like a widescreen TV. The picture is also very clear, and the goggles are very, very comfortable, especially since Fat Shark did away with the eye cups and instead have added foam padding that fits to your forehead. If you have the budget, you should absolutely go for the Dominator V3s. They just can’t be beaten in terms of form factor, quality, and flexibility. 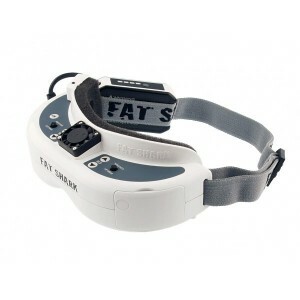 The Fat Shark Dominator HD3 are the kings of the FPV goggle world. They are everything the Dominator V3s are, but better. The difference between the Dominator HD3s and the old HD V2s is that these have a slightly smaller FOV(42 degrees) which eliminates the blurring edges which caused problems in the older ones. The foam on the faceplate is also now velcroed on to the goggles, so you can remove the foam and wash it or just replace it. If you’ve got the cash, get these goggles. But if you are tight on your budget, stick to cheaper goggles like the Dominator V3s or Attitude V3s(and if you’re willing, the Aomway Commanders). You’ll need a separate receiver module, so that’ll give you the flexibility of flying on whatever bands you wish to fly on. 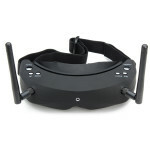 There is also a HDMI input so you’ll be able to receive HD video on the goggles – from DJI lightbridge, a Connex module, or even from your TV. The screen resolution is 800×600. The SkyZone SKY03 are from a manufacturer that makes a formidable competitor to Fat Sharks – SkyZone – and packs some superb and convenient features, such as great optics, built in diversity, and an on screen display that shows you battery voltage and band/channel. However, SkyZone seems to have screwed up the fitting and a lot of users have complained that there is lots of light leak. If you can get the goggles to fit on your face(if it matches the contours), then they pack all the features that Fat Sharks pack but for slightly cheaper. 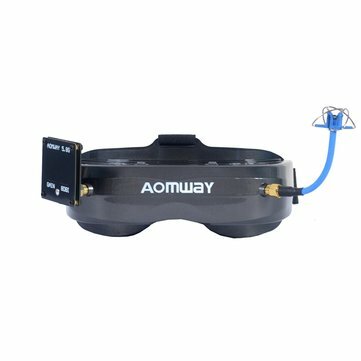 The Aomway Commander V2 are a follow up to the runaway success of the Aomway Commander V1s. For their price point, they pack a lot of features not found in Fat Sharks right out of the box. 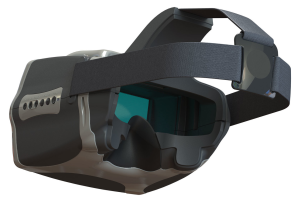 In the Commanders, you get a pair of portable Fat Shark style goggles with built in diversity, DVR, a ridiculously high 45 degree FOV screen, and support for 2D, 3D, and HDMI video. 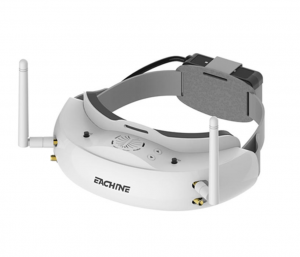 The Eachine EV200D are a super-value-for-money set of goggles that pack four way diversity, support for swappable modules, a great form factor, and a proper DVR codec. Feature to feature, when compared to similarly priced Fat Shark goggles or indeed goggles of any other company, the EV200D blows everyone else out of the water(on paper at least). The Fat Shark Transformer SE goggles are Fat Shark’s foray into box style goggles and they’ve done a solid job making a set of goggles which are functional, practical, and comparatively cheap. The field of view is MASSIVE at 55 degrees, there’s built in diversity, and the screen can detach, turning it into a ground station. What’s not to like? 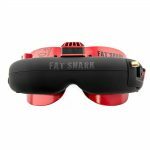 Some people may still go for cheaper offerings from Eachine, but if you like the Fat Shark brand and prefer the more immersive – but slightly clunkier box goggles, then the Transformer SEs are a good choice. Read the full review here. The Fat Shark Predator V2s are a step above the Fat Shark Teleporters in that they have a slightly better screen. They have a built in 8-channel 5.8ghz receiver, and a sleek form factor. 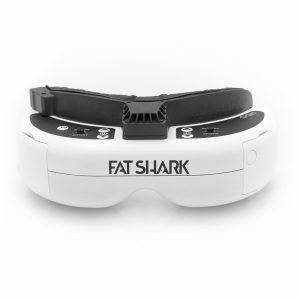 The Fat Shark Teleporters are Fat Shark’s entry level goggles. For $200, you can get an entire FPV kit – goggles, camera, receiver, and antennas. The only issue here is that the Teleporters have a rather lousy screen compared to the other goggles. If you won’t enjoy the picture, you won’t enjoy FPV. If you are really constrained by your budget, I would say go for the Quanum V2s instead. The only reason you should choose the Teleporters is if and only if the large form factor of the Quanums is a deal breaker for you(which it won’t be in most cases). The HobbyKing Quanum V2 goggles are as basic as you can get – but still deliver really awesome picture quality and offer a ridiculously immersive experience. The screen is HUGE – so you’ll feel surrounded by the picture. The Quanum V2 goggles are really simple – they’re just made up of a screen, two pieces of foam, a magnifying lens, and a neoprene sleeve that fits over the whole thing and lets you wear them on your face. 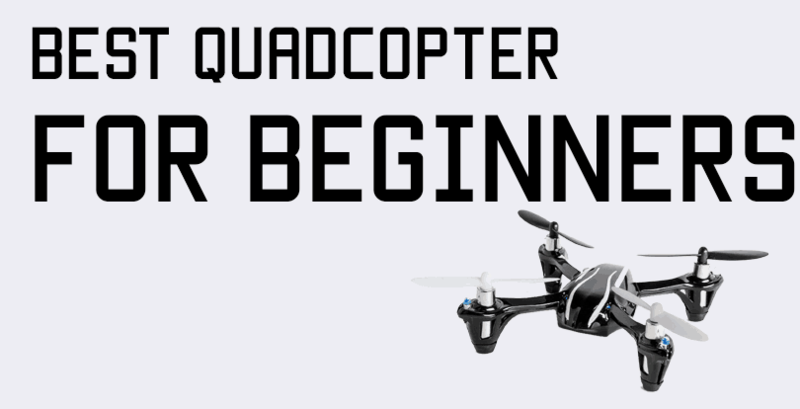 If you go for the Quanum V2s, you’ll need to purchase a battery and FPV receiver separately. This is actually advantageous because the goggles become totally modular – if one thing goes bad, you simply have to replace that one thing. Even though the goggles themselves are $55, you’ll need to spend another $40 on a receiver and $10 on a battery, so the actual cost will be more like $100(not to mention the camera and transmitter, too). Even so, the Quanum V2s are an excellent choice – if not the choice – if your main constraint is your budget. There’s a bit of a debate in the multirotor community about Quanum vs Fatshark goggles – many people swear by the box-style Quanums, yet most of the pros you see on YouTube fly the Fatsharks. 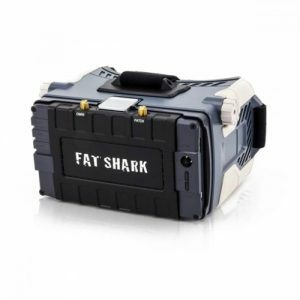 Pros for Fatsharks are obvious – they’re incredibly cheap and very modular. If something stops working, replacing it is very easy and you can pick up spares anywhere. However, they take up nearly twice as much space as the Fatsharks, and personally I feel the Fatsharks(especially the new ones with foam padding) are far more comfortable and light on your face. The HeadPlay HD Goggles from GetFPV are another set of box-type goggles. These are the like Quanum V2s on steroids! They have a huge 72 degree field of view and the screen resolution is a massive 1280×800. The Headplay HDs also have a 40 channel 5.8 ghz receiver, so these goggles are all you need – they will be compatible with all 5.8ghz transmitters. 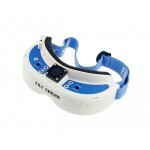 The HeadPlay Goggles are HD because they have a HDMI in port. 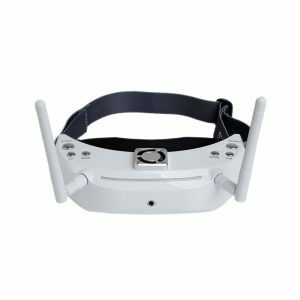 Now you can plug in Connex HD modules or DJI lightbridge systems and view their picture through the goggles. For $250, these goggles can’t be beaten in terms of picture quality and features. The only thing is that these goggles are huge on your face – so if being sleek isn’t an important factor for you, the HeadPlays are the way to go! The SkyZone Sky02 goggles are in the price range of the Dominator V3 and are packed with awesome features. The screen resolution is 854×480, giving you a good quality picture, and the field of view is 30 degrees, which is decent. The Sky02 goggles have a built in 40 channel 5.8ghz diversity receiver, so you’ll get crisp video reception on all channels, and these goggles also have an external camera, so you can see what’s right in front of you without having to take your goggles off! Another cool feature of the Sky02 goggles is that these are 3D capable – so if you have the right 3D camera and dual transmitter, you can experience FPV in 3D! The experience will be similar to how a 3D movie is. These goggles also have headtracking built in. Best goggles for FPV, ever? Many pilots prefer the box-style goggles, whilst others swear by the Fatshark style goggles. It’s really a matter of personal preference. My own is that the larger box style goggles are just way too bulky for me to carry around comfortably, and I don’t mind paying a little extra to get the extreme portability of the Fatshark goggles. If you are on a mobile device, you can scroll the table with your finger to see the rest of the goggles.